While searching for the meaning of his existence, Ben Layten (Thomas Middleditch) discovers that he very nearly, almost had an adopted sister - and, with the help of his neighbor, Tabby Song (Diana Bang), Ben sets out to find this not-quite sibling in an effort to find out if his life could have been different. When he finally tracks down his would-be sister and discovers the mysterious, Hanna Weathers (Jess Weixler), Ben stumbles upon a very different relationship than he’d been hoping for… Soon, Ben is being pulled back to life - dragged by Hanna into an exciting world of adventure and wonder and the seemingly impossible. Ben is forced to confront some dark truths as he faces the possibility that everything he thinks he knows about himself, and about Hanna, just isn’t real… and that life, and love, is a lot more complicated than he ever imagined. 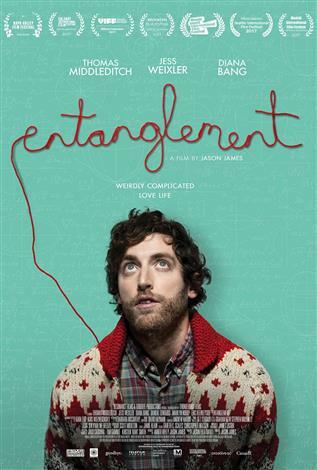 Entanglement is a magical, impossible, all too real film about the things we keep inside ourselves - about learning to let go of our fears and about accepting the fact that, on some level, everything is connected.